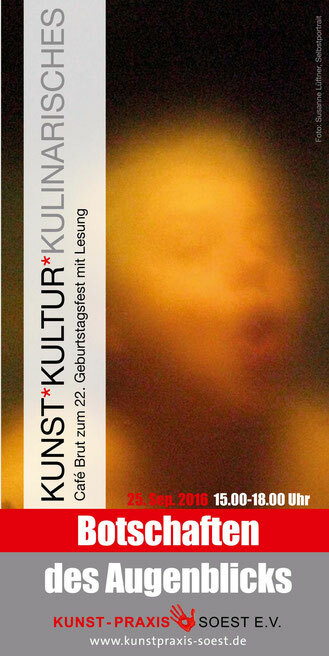 Die Kunst-Praxis lädt herzlich zum 22. 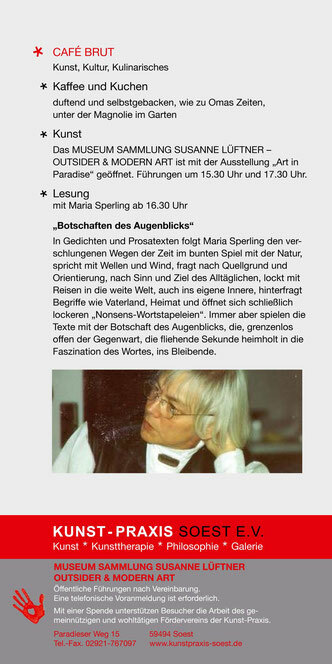 Geburtstag in den Paradiese Weg 15 ein: ab 15 Uhr zu Kaffee und selbstgebackenem Kuchen, um 16.30 Uhr zu einer Lesung von Maria Sperling. Um 15.30 und 17.30 Uhr bietet Susanne Lüftner Führungen durch ihre Sammlung "Outsider Art" an. It's amazing to pay a visit this site and reading the views of all colleagues about this piece of writing, while I am also zealous of getting know-how. Wow that was odd. I just wrote an incredibly long comment but after I clicked submit my comment didn't show up. Grrrr... well I'm not writing all that over again. Anyways, just wanted to say great blog! It's actually a cool and helpful piece of info. I am happy that you just shared this useful information with us. Please stay us informed like this. Thanks for sharing. With havin so much content and articles do you ever run into any problems of plagorism or copyright infringement? My blog has a lot of exclusive content I've either authored myself or outsourced but it seems a lot of it is popping it up all over the internet without my authorization. Do you know any solutions to help stop content from being stolen? I'd certainly appreciate it. After I originally commented I seem to have clicked the -Notify me when new comments are added- checkbox and now each time a comment is added I get 4 emails with the exact same comment. Is there a means you are able to remove me from that service? Thanks a lot! For most up-to-date information you have to pay a visit internet and on internet I found this website as a most excellent website for latest updates.